This report brings together information from the different Census themes about people aged 65 and over. 4.4% of Surrey residents aged 65+ live in a communal establishment. 13.6% of Surrey residents aged 65+ are in employment. The 2011 census recorded 172,165 people aged 65+ living in Surrey. This is an increase of 13% since 2001. 30,043 people were aged 85+, an increase of 25.7% since 2001. 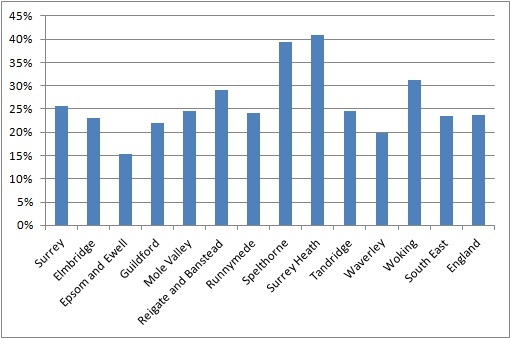 The borough with the biggest increase in older people is Surrey Heath where the number of people aged over 65 increased by 31.3% and the number of over 85s increased by 40.8%. The smallest increase in people aged 65+ was in Runnymede (7.1%) and the smallest increase in over 85s was in Epsom & Ewell (15.1%). The percentage increase in older people is higher in Surrey than England as a whole where the number of over 65s has increased by 10.9% and the number of over 85s by 23.7%. 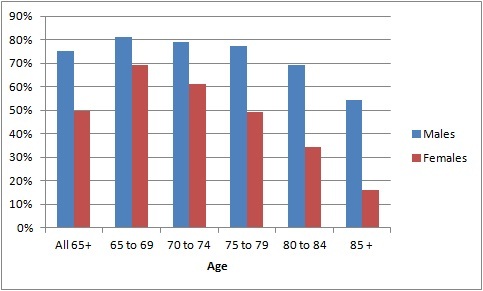 Overall 56% of people aged 65+ are female. 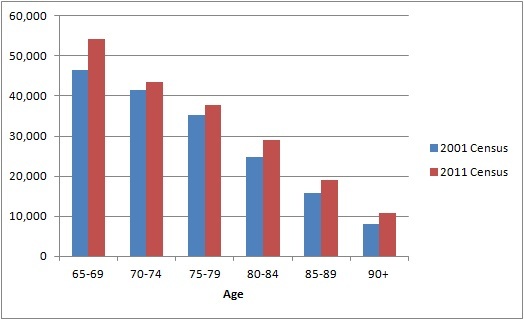 The ratio of females to males increases with age, with 73% of the 90+ age group female. 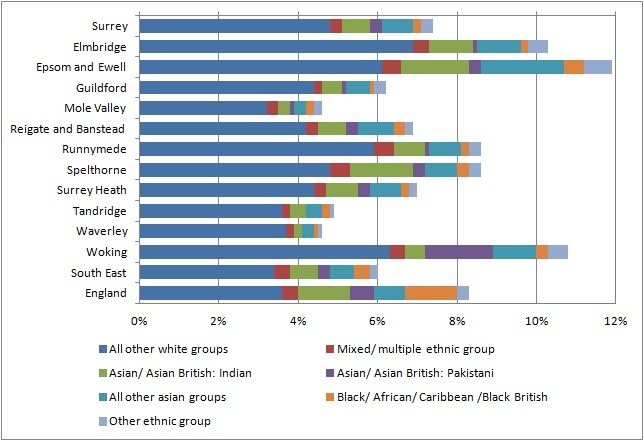 92.5% of Surrey residents aged 65+ are of White British ethnicity. Other white groups account for 4.8% with 2.7% from non white ethnic groups. The borough with the highest proportion of people from non white ethnic groups is Epsom & Ewell (5.8%, including 2.1% from Asian groups other than Indian or Pakistani). The borough with the lowest proportion of people from non white ethnic groups is Waverley (0.9%). The proportion of people from non white ethnic groups is lower in Surrey than England as a whole where 4.7% are from non white groups. 80.3% of Surrey residents aged 65+ say they are Christian and 2.0% have other religions. 9.8% say they have no religion and the remaining 7.8% did not answer this voluntary question. The borough with the highest proportion of Christians is Waverley (81.8%) and the lowest is Elmbridge (78.4%). The proportion of Christians in Surrey is slightly higher than England as a whole where 80.5% of people aged 65+ are Christian. The borough with the highest proportion of over 65s with religions other than Christian is Epsom & Ewell (3.9%) and the lowest is Waverley (0.7%). The proportion of over 65s with religions other than Christian is lower in Surrey than England as a whole where 3.4% have other religions. 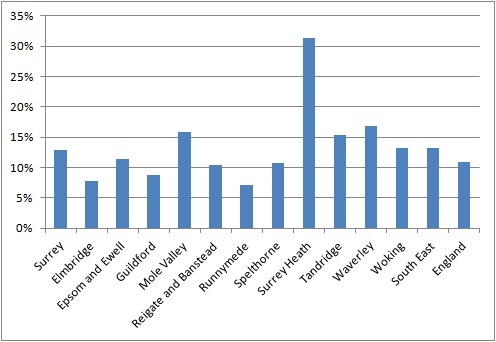 The boroughs with the highest proportion of over 65s with no religion are Elmbridge and Mole Valley (10.7%) and the lowest is Surrey Heath (8.7%). The proportion of Surrey residents aged 65+ with no religion is higher than in England as a whole where 8.4% have no religion. The Census asked people if their day-to-day activities are limited because of a health problem or disability which has lasted, or is expected to last, at least 12 months, including problems related to old age. Respondents could choose “limited a little” or “limited a lot”. 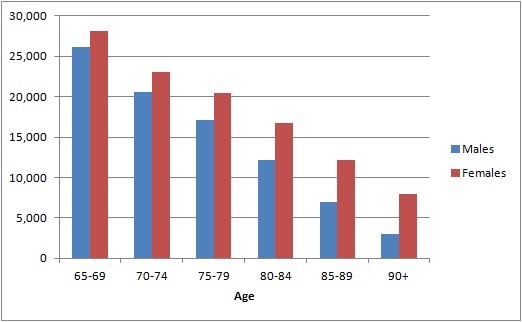 The proportion of older people who reported a health problem increases with age. 26.4% of people aged 65-74 reported such a problem, and of people aged over 85, 45.1% said their activities were limited a lot and a further 32.9% were limited a little. Respondents were also asked for an assessment of their general health over the last year, choosing from Very Good, Good, Fair, Bad and Very Bad. The proportion of older people reporting bad or very bad health increased with age. 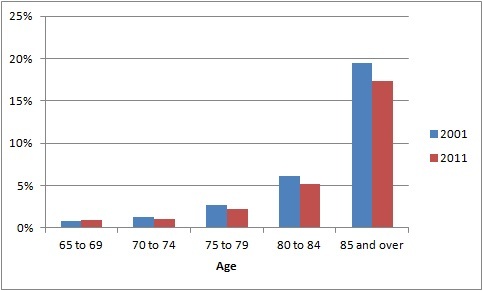 6.2% of people aged 65-74 reported bad or very bad health, rising to 18.3% of over 85s. 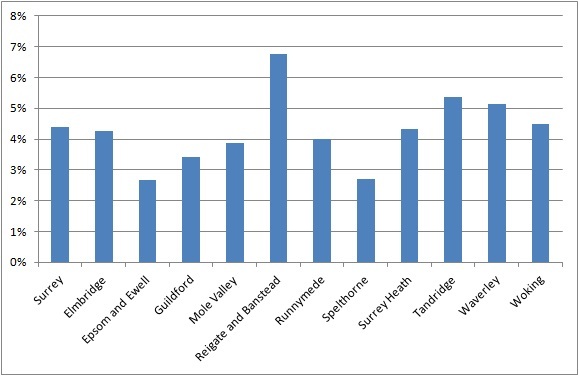 The borough with the highest proportion of older people reporting bad or vey bad health is Spelthorne (8.3% of people aged 65-74 and 21.3% of people aged 85+) and the lowest are Mole Valley (5.0% of aged 65-74) and Waverley (15.5% of over 85s). The proportion is lower in Surrey than England as a whole where 11.2% of people aged 65-74 and 23.4% of people aged 85+ reported bad or very bad health. The census asked people whether they give any help or support to family members, friends, neighbours or others because of long-term physical or mental ill-health or disability, or problems related to old age. 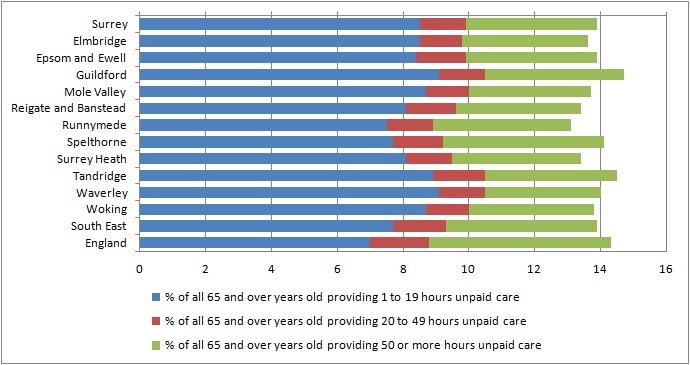 More than 25,700 of Surrey’s older residents (14% of the population aged 65+) were giving unpaid care, 7,356 of them for more than 50 hours per week. This section brings together data from tables on resident type, household composition and living arrangements. 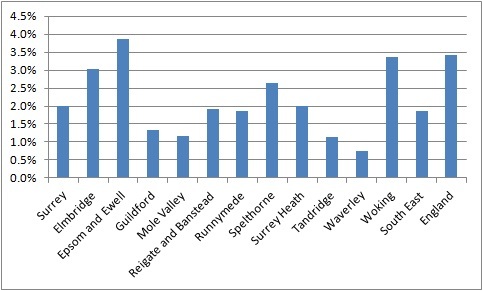 Overall, 4.4% of Surrey residents are living in a communal establishment, such as a residential care or nursing home. The borough with the highest proportion living in a communal establishment is Reigate & Banstead (6.8%) and the lowest are Epsom & Ewell and Spelthorne (2.7%). The proportion increases with age with 0.9% of people aged 65-69 living in communal establishments but 17.3% of over 85s do so. The proportion of over 85s living in communal establishments has fallen since 2001 when 19.5% did so. Of Surrey residents aged 65+ living in households, 75% of males are living in a couple compared with 50% of females. The proportion decreases with age and of people aged 85+, 54% of males and 16% of females are living in a couple. The census outputs on household compositions include 3 household types which are composed of people aged over 65 only. Of the 186,000 Surrey residents aged 65+ who live in households, 31% are living alone. A further 45% live in “one family” households where all residents are aged 65+. 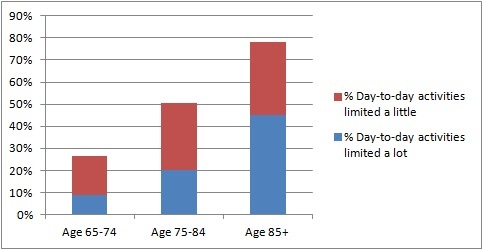 A small percentage (2%) live in other household types where all residents are aged 65+. The remaining 22% live in household types which include younger people and the census outputs do not provide any further breakdown. The census outputs include car availability for the household types which are composed of people aged over 65 only. Older people living alone are less likely to have access to a car than those living in other household types. Of the people aged 65+ who live alone 44% have no car or van. Of the “one family only– all aged 65+” household type, 8% have no cars or vans in available to the household and 43% have two or more. Almost 27,000 (13.8%) Surrey residents aged over 65 are economically active. 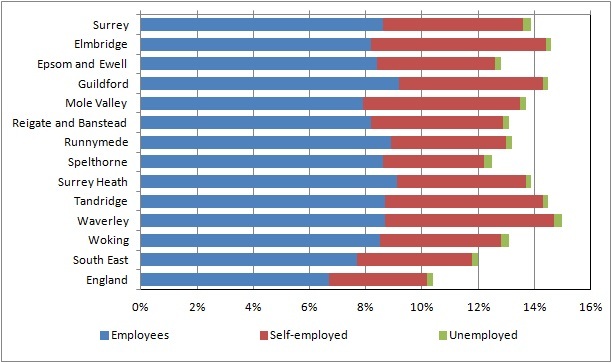 8.6% are employees, 5.0% self employed and a small number are unemployed. The borough with the highest proportion of residents aged 65+ who are economically active is Waverley (15.0%) and the lowest is Spelthorne (12.4%). Surrey residents aged 65+ are more likely to be economically active than in England as a whole where 10.4% are economically active. The majority of Surrey residents aged 65+ who are in employment are working part time (fewer than 30 hours per week). 61% of employees and 57% of the self employed work part time.